I know that putting socks on your baby’s hand is clearly a fashion statement that is well before its time… but I don’t think Kyler knows. Whatever, he’s just stylishly conservative. I put his sense of style in mind and started looking for alternative scratch-relief options for his little hands aside from the mittens that NEVER STAY ON to the socks that are supposed to be for feet, or so he says. I’m sure any parent with an eczema-suffering baby understands. Google quickly led me to Scratch Sleeves from the UK. Let’s start by saying I clearly want my kid’s hands to touch and feel things, but there are occasions where I can’t monitor him 24/7 and he gets free of his socks, mitts, and swaddle to satisfy the urge to scratch an itch. Not that running across a room to pin his hands back when the socks do get rubbed off is great exercise… it’s just not the kind of aerobic workout, coupled with anxiousness on identifying which chunk of skin he removed next, that I’m looking for. Well, the English have it right. I don’t get why no one has invented these in the States… hmmmm, maybe I need to quit my day job, but they are such a life-saver. When I found these online, my immediate reaction was, "this is an EASY DIY! ", but I did not have the time to work on it and I needed them FAST. He was going through all of his hand-hiding options like it was some sort of record to break. They came fairly quickly even having to jump across the pond. We bought four and took advantage of the bulk buy discount. As soon as we received them, they were washed and he was hanging out with them. They have been miraculous in our home. He can get used to being unswaddled and we’re relieved that he’s not going to hurt himself constantly. I can’t say enough about how much I am thankful for these "mitts that stay on". They really do stay on. He can still play with them, hitting Sophie and swatting at his toys. The mitten parts are silk, which was was worried about the fibers scratching him, but have turned out to be very nice and smooth. I think the ‘cool’ touch to them also relieve him when he does try to scratch. The peace of mind for us has been invaluable. I would recommend these to any parents with itchy babies to help manage their symptoms. ScratchSleeves did not ask me to review their product. We paid for them and have just been happy customers. 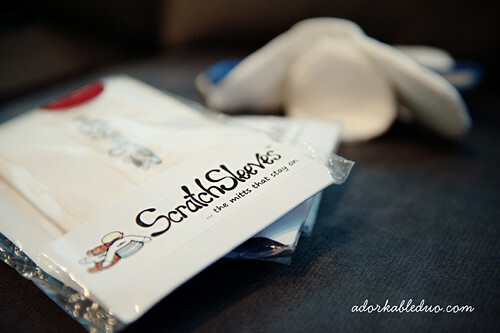 There is a very similar product that comes out of Australia, I believe – they’re called Scratch Me Nots (www.scratchmenot.com) and they are upfront a little more expensive but they offer free ground shipping to the US – plus a lot of cute styles. I’m trying to decide between the two right now myself.